The Toyota Camry is as dependable as a Labrador Retriever—with great fuel efficiency, top safety ratings and a peppy new trim level added to the lineup, the 2014 model year emphasizes its desirable qualities while changing the aspects of the 2013 model that consumers didn’t like. While the exterior hasn’t seen much change, the interior has seen an increase in quality materials used, refining the cabin with high end stitching and fine wood grain styling on the dash and door panels. The cabin is also quieter than ever after Toyota utilized specialized technology to determine the places sound was entering the cabin, taking additional sound-absorbing measures to decrease outside noise within the car. The 2014 Camry also sees a kick of power with the newest SE Sport trim level, which utilizes a 3.5-liter V6 that generates 268 horsepower, allowing the Camry V6 to reach 60 mph in 6.6 seconds. With this engine, the fuel economy is a combined 25 mpg. If you’re looking for something a bit more fuel efficient, the 2.5-liter 4 cylinder Camry Hybrid gets an impressive 43 mpg city, making it the most fuel efficient trim level available. 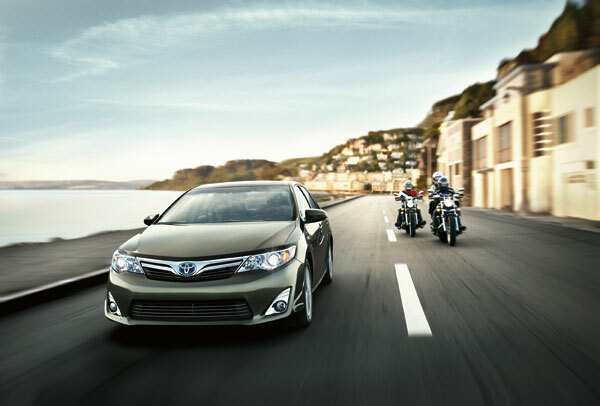 In government crash testing, the Camry received a top score for overall crash protection with the Insurance Institute for Highway Safety awarding the 2014 Camry the best possible rating of “Good,” becoming a IIHS Top Safety Pick. On Top: Camry Regains Top Spot as Best-Selling Car in U.S.